The laboratory led by Prof. Yin Yuxin of the PKUHSC School of Basic Medical Sciences (SBMS) identified for the first time the role played by PTENα, a protein of the PTEN family, in the regulation of learning and memory. This discovery provides important clues for the understanding of the complexity and pathology of the nervous system. The findings were published on the June 20 issue of Cell Reports from Cell Press. Read the article, “PTENα Modulates CaMKII Signaling and Controls Contextual Fear Memory and Spatial Learning”, at http://dx.doi.org/10.1016/j.celrep.2017.05.088. The PTEN gene is known as a tumor suppressor and is involved in the regulation of the nervous system. Clinical research suggests carriers of this gene are more likely to develop neurological diseases such as epilepsy and autism. PTENα was the first identified isoform of the PTEN family and was discovered by the same group in 2014. 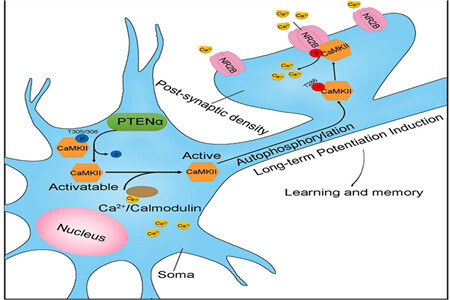 The newly published study revealed the interaction between PTENα and CaMKII, which updated the understanding of the functions of the PTEN family and suggested new mechanisms behind neurological diseases.